The head of the property developers' industry body yesterday called on the Government to ensure the market remains healthy. He said developers have been feeling the pain of recent property curbs and the threat of a supply overhang, but are working to boost productivity. "It is our hope that the Government will calibrate its land sales programme to ensure land supply at a pace that will contribute to the overall health of the market," said Mr Chia Boon Kuah, president of the Real Estate Developers Association of Singapore. 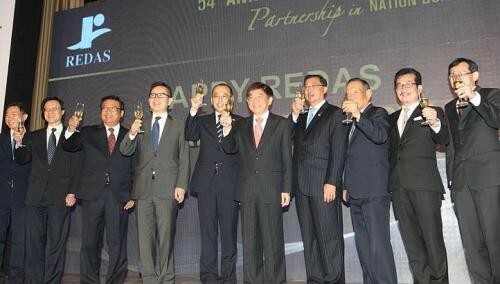 Speaking at the association's 54th anniversary dinner at the Ritz Carlton Millenia hotel, Mr Chia said the Republic is in a "maturing" real estate cycle and developers are concerned about a bumper crop of new supply. However, he added: "We have faith that the Government will continue to monitor the movements in Singapore's property cycle, and ensure a balance between development viability and housing affordability." Minister for National Development Khaw Boon Wan was guest of honour. He did not give a speech. The property market has been subdued in recent months owing to several rounds of cooling measures and tough restrictions on home loans that were imposed in late June. Even so, bid prices at state land tenders have been bullish in recent months. Private home prices have also continued to creep up, though some developers slashed prices at new launches in September to boost sales. Mr Chia said that "as long as homes are purchased with sound reasoning, we believe in riding out each cycle that comes our way". He added that the association was committed to working closely with the Government to plan joint responses for various scenarios that could arise from changes in the domestic and global environment. A bumper crop of up to 700,000 new homes will be built by 2030. Another priority, he said, was the real estate and construction industry's long-term sustainability, noting that local developers are taking steps to improve productivity. The real estate and construction industry employs about 20 per cent of the active workforce. It has been feeling the pinch from tightened foreign labour inflows, which result in higher manpower costs.